The federal government (Government) imposes unique requirements on entities that sell, directly or indirectly, goods or services to the Government. These requirements vary according to type of contract (e.g., fixed-price, cost-reimbursement), by item (e.g., specially manufactured items, commercially available items, software and intellectual property, construction) or service (e.g., information technology, janitorial, architect/engineering, leasing), and by agency. Saul Ewing Arnstein & Lehr Government Contracts attorneys have broad experience in each of these areas. Our seasoned team includes professionals who have significant experience working in-house for Government contractors and who are highly skilled in providing advice that combines both legal and operational requirements so that our clients may better manage the risks associated with doing business with the Government. We advise on virtually all aspects of doing business with the Government. We represent prime contractors, subcontractors, suppliers, grant recipients and grant sub-recipients, as well as for-profit and non-profit entities. We represent clients across a wide array of industries, including information technology; health care; construction; telecommunications; higher education; aerospace; manufacturing; life sciences; leasing; and professional services. We have experience in virtually every defense and non-defense agency, as well as Congress and many state and local governments. We handle matters spanning the life cycle of a Government contract or federal grant. Our Government Contracts team works collaboratively with other key Saul Ewing Arnstein & Lehr practices including the White Collar and Government Litigation Group and Construction Group, to provide comprehensive and targeted solutions to help our clients address a wide array of issues. We work with clients to establish, implement and administer business ethics and compliance programs required by regulation. We understand “best practices” for compliance programs and are adept at designing a program that is appropriate for the size of a client’s operations. We work with companies to develop procedures to respond to allegations of improper practices. We also conduct employee training and compliance audits. We represent buyers and sellers of Government contractors. 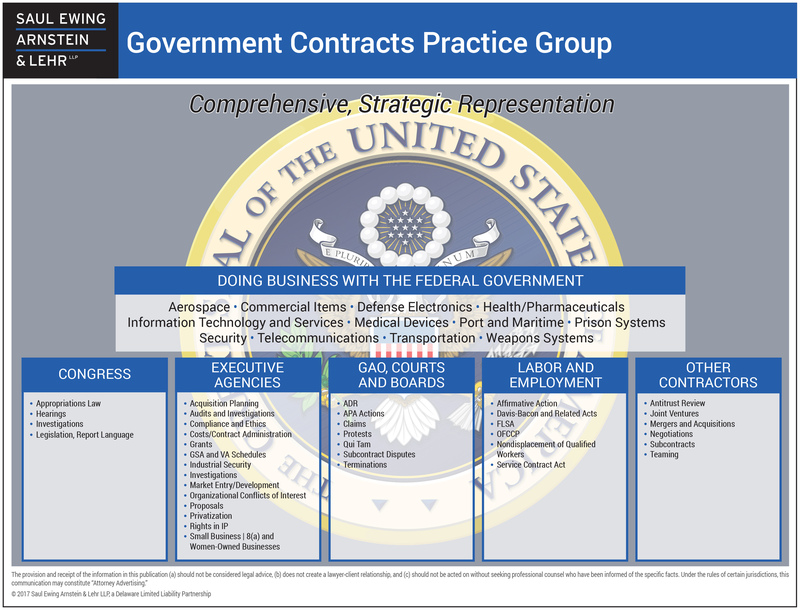 Having completed several dozen such transactions, we understand the unique issues – such as OCIs, impact on past performance projects, small business status, security clearances, foreign ownership and novation of Government contracts – that come into play when buying or selling a company that does business with the Government. We also advise clients as to post-closing integration issues. The Government Contracts Practice advises clients in connection with DCAA, GSA and IG audits, and has been successful in persuading these agencies to change their position regarding cost disallowances and other issues. We perform internal investigations and draft required Government disclosures regarding Government overpayment and possible False Claims Act issues. We have represented numerous clients in the defense of qui tam claims, and have been successful in persuading the Government to decline intervention in such cases. We also assist clients in responding to a broad variety of criminal, civil and administrative investigative subpoenas and search warrants. Our team works with clients in establishing and maintaining Organizational Conflict of Interest (OCI) Mitigation plans, allowing our clients to perform contracts that they may have otherwise not been awarded. We have worked with clients to resolve a wide variety of contract performance issues, including on issues as disparate as unreasonable inspection of janitorial services and manufacturing delays due to defective specifications of an aerospace part. When negotiation fails, we litigate contract disputes before the Boards of Contract Appeals and the Court of Federal Claims. We also arbitrate and litigate prime-sub disputes before state courts and domestic and international arbitration tribunals. In addition, our attorneys work with clients to respond to unfavorable CPARS (negative performance reviews). We advise companies in connection with the negotiation, award and performance of GSA and VA multiple award schedule contracts. For example, we work with clients to establish compliance programs for monitoring compliance with the price reduction clause and the Trade Agreements Act and advise in connection with pre-award and post-award audits. We have significant experience in the small business arena. We advise companies with respect to qualifying as a small, 8(a), veteran, veteran-disabled or other minority business categories. We work with clients to devise strategies – through joint ventures, teaming arrangements or other strategic alliances – to take full competitive advantage of the federal contracting socio-economic preference programs. We also protest and defend size protests at the Small Business Administration Office of Hearings and Appeals. We also work with clients to establish small business subcontracting procedures. Our attorneys have experience handling matters pertaining to the unique rules and clauses (contract and grant) governing intellectual property and the Government’s right in technical data and computer software. We advise our clients on the Government’s right to technical data and computer technology and on strategies to help contractors maximize protection of their intellectual property rights. We train clients’ employees on how to protect a company’s intellectual property when doing business with the Government, and have negotiated data rights with the Government on behalf of our clients. We also assist clients in protecting against the improper release of proprietary information under the Freedom of Information Act. Our Government Contracts team collaborates with our Intellectual Property attorneys on IP matters as the need arises. Our clients include companies that serve as prime or subcontractors on federal construction projects. We counsel companies on a wide range of issues, including those arising in connection with design/build projects. We assist clients with legal matters arising during planning and contracting through project performance, litigation and alternative dispute resolution. We understand the various stages and complexities of construction projects as a result of our hands-on experience in the industry. Our Government Contracts attorneys often work with our colleagues in the Construction Practice. Our attorneys have experience advising clients on issues relating to federal and state grants. We counsel clients regarding compliance obligations arising from grants, as well as draft sub-recipient grant documents and grant subcontracts. We also assist clients in connection with other federal procurement vehicles, such as cooperative agreements and cooperative research and development agreements. We represent companies either challenging or defending contract awards or procurement procedures in bid protests. Our attorneys appear before the U.S. Government Accountability Office (GAO) and the U.S. Court of Federal Claims. We also represent companies in state and local bid protests in several states, including Pennsylvania, Maryland, Florida and Illinois. Our team advises Government contractors on numerous labor and employment issues, including the Service Contract Act, Davis Bacon Act, Affirmative Action and other non-discrimination requirements, OFCCP audits and investigations, and the Fair Labor Standards Act. We also advise clients on issues relating to theft of trade secrets and violations of covenants not to compete relating to current and prospective employees. Our lawyers are skilled in working with clients to resolve these issues – either by negotiation or when necessary litigation.